When approaching a fence, when going over and when landing, it is necessary for one’s horse to be straight so it can use all its strength and muscular power. Many faults are the result of a jump drifting to the left or the right of the fence. Propulsion then only occurs with one hind leg. The horse twists in flight and usually lands on the same front leg. 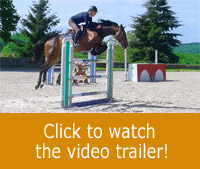 In the end the horse is physically affected and the quality of its jumps degraded. Actually, discussing straightness brings us back to ‘bending’. To be straight, a horse must first be prepared with flat work, with suppling and muscle building on a circle. Working on a circle allows the horse to increase its strength and suppleness. 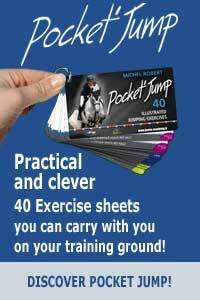 Building up muscles, as well as improving the way joints work, is obtained by greater demand on the near hind leg and by stretching the horse’s off leg. You should get used to keeping the horse on the circle with your inside and outside aids. Later, you will be able to use the same aids to keep your horse straight. When the tracks of the hind legs cover those made by the front feet, one can say that the horse is straight, whether it is moving in a circle or on a straight line. However, a straight horse calls necessarily for a straight rider. The first image that comes to my mind is that of a tightrope walker. He keeps his balance thanks to the correct distribution of the weight of his body in relation to the tightrope he is walking. Every move he makes takes place in a perfect balance. Guided by his wide-angle vision, he is able to master each gesture, while maintaining a clear vision of the overall situation. He never looks down. Just like the tightrope walker, the rider must be placed in a centred position on his horse: his pelvis bones in line with the horse’s median axis, the spine straight supporting the head and with wide-angle vision. The best teacher is the mirror in the covered school. It never cheats. Jumping a fence facing the mirror is an excellent exercise. One can also place a corridor of poles before and after the fence. 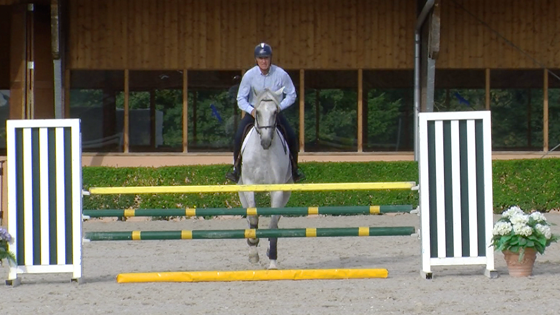 After jumping the fence a few times, the rider will become aware of his attitude and position. If he is capable of controlling his horse’s shoulders and haunches in relation to the median axis of the fence and of the corridor of poles, he has succeeded. One must always attempt to ride the approach, the fence and the landing following a straight line. The slightest drift to the left or the right must immediately be rectified. The more one waits before reacting, the more difficult it will be to return to the axis. The mirror allows one to quickly determine the primary cause of any eventual defects in the straightness. 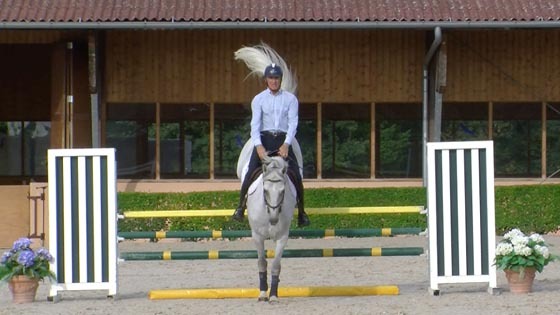 A defect that may come from to the rider’s position, but also from a horse one has allowed to drift for too long.